Thanks to Android 2.3 Gingerbread and the Adobe Flash 10.3 support, the Xperia mini pro’s web browser does a great job. The 3-inch HVGA screen may sounds not enough, but we can assure you it is and you have all that 3 inches for web browsing. The Xperia mini pro's browser supports double tap and pinch zooming, along with the dedicated virtual zoom buttons. The web browser has full Flash support with the Adobe Flash 10.3 player (downloadable for free from the Market). YouTube videos played quite smoothly (360p), and so did the games from Kongregate, for example. The high-quality videos on YouTube and other Flash video services had some (or lots of) dropped frames, but the overall Flash performance turned out pretty decent. The YouTube app is still there though, just in case. 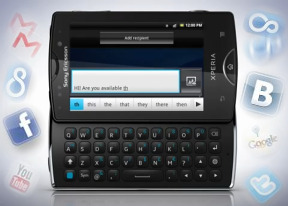 The Sony Ericsson Xperia mini pro comes with a solid set of organizing options, including a document viewer. The app in question is OfficeSuite and it has support for viewing document files (Word, Excel, PowerPoint and PDF, including the Office 2007 versions). For editing, you will need to get the paid app ($10). Reading documents is quite comfortable despite the compact screen and panning is blazing fast. There is also a calculator aboard. It is nicely touch optimized - the buttons are really big and easy to hit. But all of the applications missing on the Xperia mini pro can be downloaded for free off the Android Market in a matter of minutes, so it’s not a big deal really. There are lots of icons in the in the main menu to mimic apps, but most of them are actually shortcuts to the web browser. The ones that do something are the Update Center - to check for updates from Sony Ericsson, NeoReader - a barcode scanner and Touchnote to create virtual postcards. That's pretty much all. The Sony Ericsson Xperia mini pro comes with a GPS receiver, which locked onto satellites in about 3 minutes with A-GPS turned off. You get the Xperia mini pro with Maps 5 out of the box, which gives you access to some great features. Offline rerouting is one – if you stray off course, Maps will recalculate the route without the need for an Internet connection. You can’t change the destination without connection though. There are also 3D buildings (where available), two finger rotation, tilting and so on. Depending on your region you may get the Xperia mini pro with Wisepilot navigation pre-installed, but you'll have to pay for it.